Kennedy Castles and other Homes in Ayrshire - a One-Day Tour! It is possible to take in a number of former Kennedy castles and other homes in Ayrshire in one day - even on a bike! On May 27th 2006 I took my bike on the train from Glasgow to Ayr then cycled the following route, totalling 37 miles. For the purposes of this account we will assume you are seasoned explorers and have already 'done' Culzean and Dunure. From the centre of Ayr take the minor B7024 road south. This route unfortunately misses out on Cassillis House, the official residence of the Marquis of Ailsa. You will pass Burns' Cottage but no time for that today! As soon as you leave Ayr the road climbs up along the flanks of the Carrick Hills and we pass our first Kennedy home - Newark Castle. The castle sadly cannot be seen from the public road and stern Private notices keep us out. Quoted commentaries are all from MacGibbon and Ross. 'This structure is situated about 4 miles south from Ayr and not far from Kirk Alloway and Brig o'Doon. It occupies a rising position on the slopes of the Carrick Hills and stands on a rock which pierces through the soil and from which the surrounding ground falls away. Newark was a jointure house of the Kennedies of Bargany and the following few historical notices of the place occur about 1580. 'Black Bessie Kennedy was infest in the New-Wark by Bargany ... The Laird of Auchindrayne (a neighbourly proprietor) was suspected by the deceased's friends of being an accomplice 'left his awin house and zeid to the Newark (residence of Duncan Crawford of Newark) quhick wes but ane myle disserentt fra Auchindrayne'. He appears to have taken this step because of the strength of Newark; for when the friends of the murdered Laird came out with horsemen expecting to find him on his way between the two houses he had reached Newark in safety and managed with assistance to make them retire 'with schame'. If you have the time, make a point of stopping at Cassillis View about one mile before you get into Maybole. Then email me what if anything of note you could see. Maybole has a fascinating history, much of it bound up with the Kennedys. There is Cassillis Road, the Cassillis Hotel ... I could go on but if you only look at one thing in Maybole it has to be the old Collegiate Church. From the main A77 road south through town (note all the posters clammering for a much-needed bypass) turn left at the library down a steep street and take the first right at the churchyard.. Beyond the churchyard are the ruins of the Collegiate Church. You cannot get in at this stage, more pedalling is required. Carry on south along the A77 and within sight of each other, you will find two further Kennedy homes; Baltersan castle and Crossraguel Abbey. There is a lay-by on the opposite side of the road at Baltersan, of course if you are on two wheels it is easy to stop on the verge and take a picture. Literally at the next bend in the road and on the same side of the road (left if heading south) is Crossraguel Abbey which at the time of writing costs �3 per adult entry. There is a car park and light refreshments and guide book are available. The Abbey was founded early in the thirteenth century by Duncan of Carrick, later Earl of Carrick, as a daughter house of Paisley Abbey. William Kennedy, brother of Gilbert, second Earl of Cassillis, took his monastic vows and became abbot in 1520. He was succeeded in 1547 by his nephew Quintin Kennedy, the first secular commendator. Both William and Quintin were eminent statesmen and scholars whose association with Crossraguel can only have enhanced the abbey. After Quintin's death in 1564 the fourth Earl of Cassillis took possession of the abbey. The following year Alan Stewart was appointed commendator. It was he who goes down in legend for having been roasted over a fire by Cassillis to make over the abbey and lands to the latter (this event took place at Dunure Castle). By the early 17th century the last of the monks had died and the life of the abbey was at an end. (source: Crossraguel Abbey guidebook, Historic Scotland). 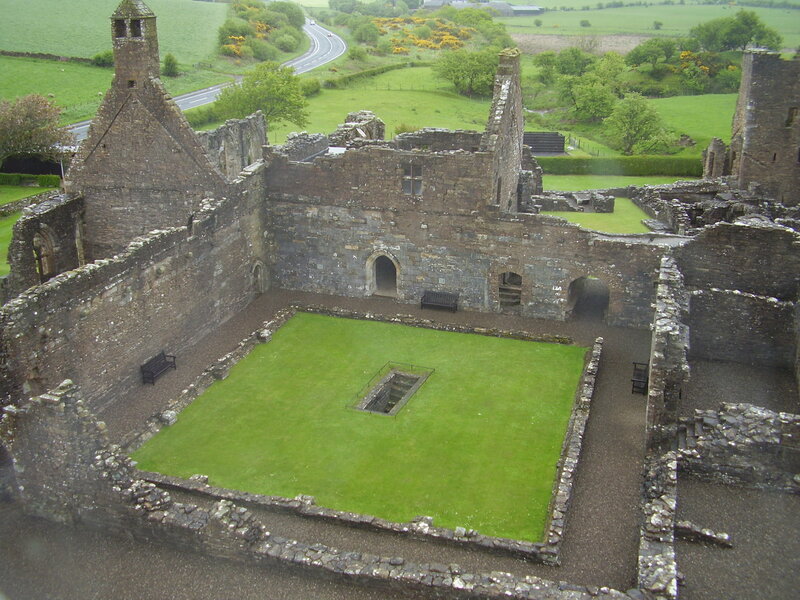 An aerial view of Crossraguel Abbey from the top of the gatehouse. Before you leave Crossraguel, don't forget the key to the Collegiate Church in Maybole. You will have to leave some contact details to get it. Back to Maybole (about 2 miles door to door) and you are inside the locked gate of the old church. There is a prominent set of Kennedy arms over one of the archways and a simple and sadly crumbling stone listing all the Earls of Cassillis who were buried there. 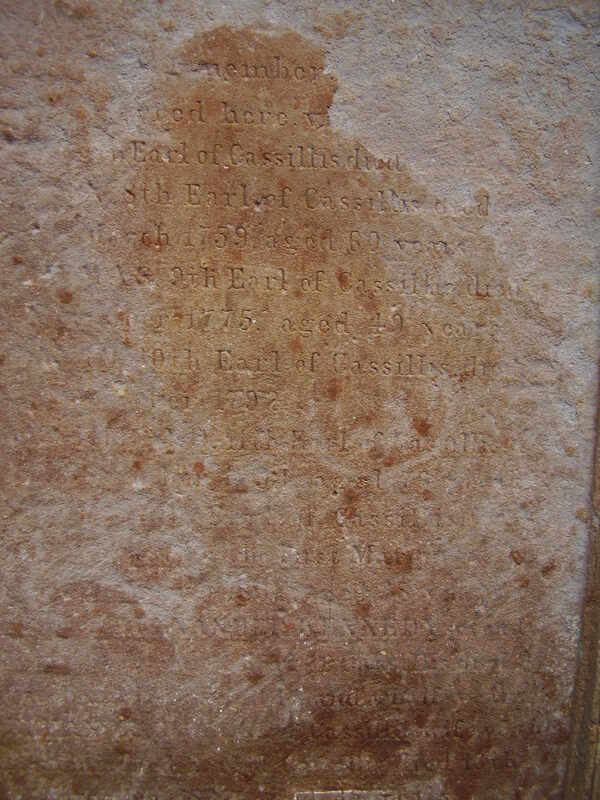 Most of the inscription has flaked off which is a great shame. Now, don't forget to go back to Crossraguel with that key!! From Crossraguel, return a second time to Maybole and take the unclassified minor road to the right (east) - the road is marked 'Kilkerran and Dailly'. The first site you come to on the left is Auchenwynd Farm and not long after that, the legendary Kilhenzie (pronounced 'Kilhinny') Castle... former home of Alexander Kennedy of Craigoch and Kilhenzie. It is now a farmhouse. Inside the first gate the drive forks and at the fork is the stone pictured below. It is not clear if viewing is permitted or not but it wasn't long before the dogs started barking to announce my arrival so I left. Michael Moss has a picture on p29 of his book on the Kennedys. 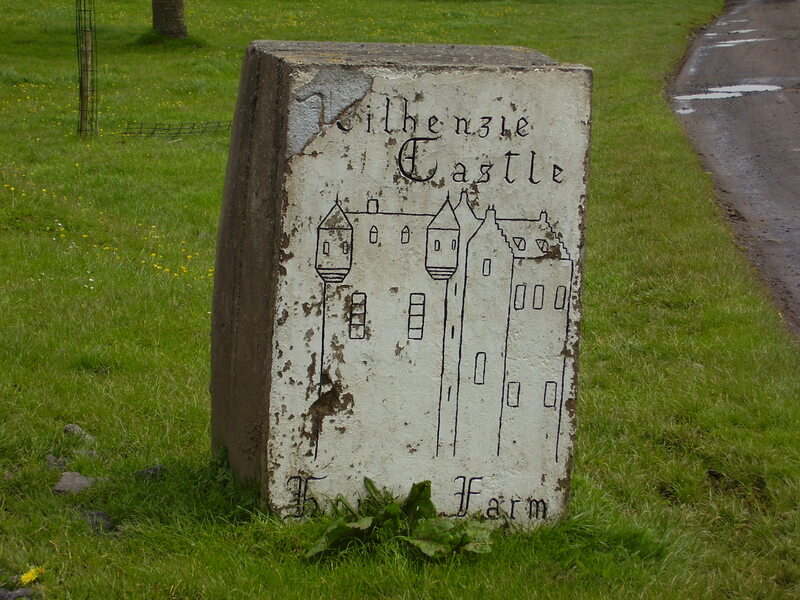 The stone marking the approach to Kilhenzie Castle south of Maybole. 'A simple keep of the fourth period which, after standing some time in ruins has now been restored and enlarged into a modern mansion. It stands on high ground about 1.5 miles south of Mayble. John Baird Laird of Kilhenzie was well known at the end of the sixteenth century and concerned in local feuds of the time.'. Alexander Kennedy of Craigoch and Kilhenzie died in 1698. He is named in a feu-charter with John, Earl of Cassillis in 1670. After Alexander's death his title appears to have been taken by his son John who was thus 'John Kennedy of Kilhenzie'. There are plenty more Kennedy castles to be seen in Ayrshire so look out for my next day-tour. Most of the above trip could also be done, and more easily, by continuing on the train to Maybole although there are not nearly so many trains on the final leg. Take care to check return train times from Maybole as there can be large gaps especially at the weekend, although there is a more regular bus service (the stop is just outside the railway station, same side for returning to Ayr or stand across the road at an unmarked stop if heading in the other direction). The distance between Ayr station and Maybole taking the B-road is about 15km.